It’s important to make sure you can capture the action with your GoPro by using the right media card. You should use a microSD card that’s optimized for video capture. Not just any media card will do. Forget about capturing a continuous movie in high definition (HD) if you’re not using the right type, and if you have your heart set on capturing 4K video, the plot thickens. Capacity plays a big part, but speed matters most. Because media cards have so many uses, the capacity of a card and the speed at which it transfers data will vary. Regardless of which kind of card you’re using, here’s a breakdown of the Speed Class Rating system, a system created by a consortium of manufacturers. You can find more information at www.sdcard.org. HD movie files are large, and the 4K ones are even bigger. That’s why it’s important to have a large-capacity card so it doesn’t fill up sooner rather than later. Today, microSD cards continue to increase in capacity while going down in price. But sometimes the difference in price between using the right card and a slower one isn’t that much different. That’s why you should purchase the card based on its speed and storage, and not because of its cost. Not all Class 10 cards are created equal. They represent the minimum speed requirement, so even cards from the same manufacturer differ in speed. Lexar 633x Class 10: This card comes in three sizes — 16GB, 32GB, and 64GB — and offers a maximum transfer speed of 95MB per second. Samsung Extreme: This media card has capacity up to 64GB and transfer speed up to 70MB per second. 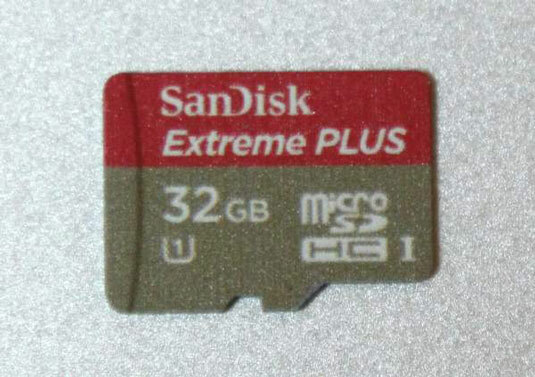 SanDisk Extreme: SanDisk’s Extreme Plus (see Figure 3-1) comes in three sizes: 16GB, 32GB, and 64GB. The Extreme Pro is faster, with speeds up to 95MB per second, but is available only in 8GB and 16GB versions. GoPro can capture 4K video, which shows twice as much detail as HD. With great quality, however, comes great size. Capturing 4K video requires a fast, high-capacity card, because 4K takes up far more space than HD does. How much depends on the frame-rate setting. Regardless, 4K video is going to take up more than half of the capacity of the card, so a 32GB card with 4K video on it will hold less than a 16GB card would. The best type of card for you depends on what you’re trying to do and on your budget. Still-image capture requires less transfer speed than video does, so if you don’t have the fastest card, you can still get by. When you’re shooting HD movies, though, you need a card with a write speed that can keep up with movie capture. Using a low-speed card is like having slow workers on a factory assembly line; it makes the operation less efficient. GoPro recommends SDHC cards with a minimum Class 10 rating. Slower cards will work, but they process moving images less efficiently. Also, there’s always a risk that a slower card will lag and stop recording. Worse, you could lose data with a slow card. If you’re doing 4K, consider UHS Speed Class 3 cards for seamless capture. They’re the most expensive cards but are designed for the fastest transfer rates.